We've been fans of the lovely Anna-Louise Sleepwear collections for a while now, and even featured this sleepwear in our proudly South African online shopping gift guide last year. After meeting Anna, the lady behind the brand, it's not hard to see why her business has gone from strength to strength and is so well supported. What we love a lot about Anna-Louise Sleepwear is that these jarmies are perfect to custom order for a bride and bridesmaids for a wedding day. You can order anything in their collection, and have names and/or initials embroidered onto the item, and make sure that the bride and bridal party sleep in luxury and style! 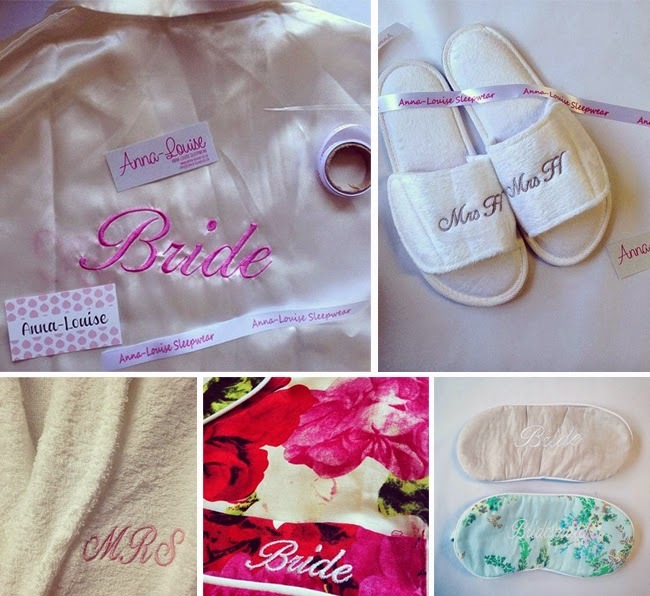 Below we've featured some of the gorgeous bridal sleepwear that can be custom made, as well as the Winter 2014 collection from Anna-Louise Sleepwear. If you'd like to see previous collections, pop on over to their site for more, and enjoy our exclusive interview with Anna-Louise herself. Growing up, my mum had her own businesses so I would say I've always dreamed of following in her foot steps. I've always been into fashion and styling so I knew the fashion industry is what I would one day want to get into. 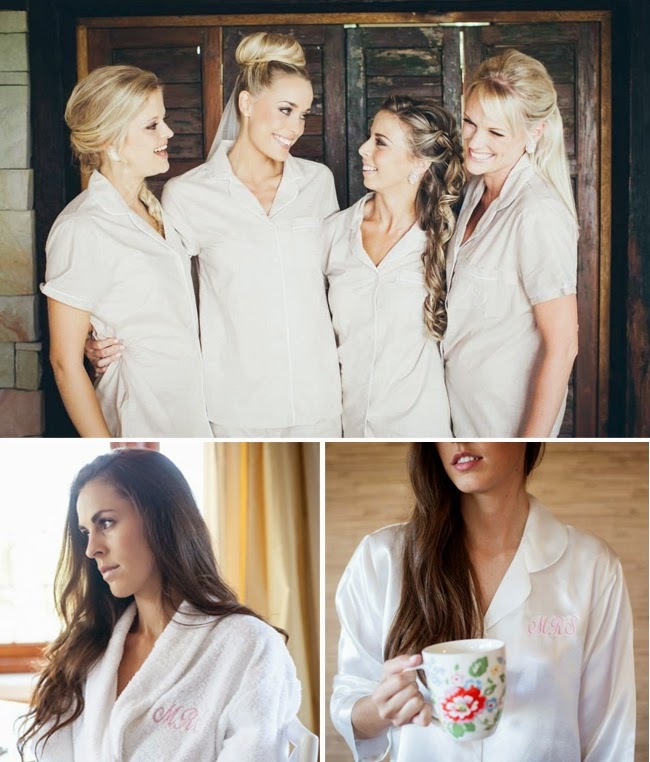 Anna-Louise Sleepwear is a luxury sleepwear collection, that is designed and made locally in South Africa. Our fabrics are soft and comfortable, our style simple yet elegant, which make our sleepwear the perfect item to slip into after a long day in the office or after a relaxing bath. Anna-Louise Sleepwear is a farewell to the big baggy old t-shirt and a welcome to stylish and beautiful sleepwear. Anna-Louise creates calm in the evenings, a balance in the chaos of life that helps leave the stresses of the day behind. Spoil yourself with Anna-Louise Sleepwear if you want to go to bed feeling & looking stylish, sleep in comfort and be able to walk around your home with guests and still be in your sleepwear. Just a warning, you might never want to take them off! As a wedding blog, we’d love to know how your products fit in with the wedding industry? We personlise our sleepwear, making it the perfect gift for a bride to be. Any embroidery can be added to your sleepwear sets. We also do gown’s, which are the perfect item for a bride to spend the morning of her wedding getting ready in. Again, we can personlise the gowns for you. Another favourite with bride’s are our satin sleepwear set’s. Creative, inspired, willing to make changes to improve our design and fit. I'm also happy to hear criticism so I can improve on our collections. People would say I am a perfectionist. I gained experience in retail, fashion, media & styling by interning at Marie Claire magazine, working at Fairlady magazine for two years and then working for the Platinum Group before focusing on my designer dream. After finishing school, I went on to study at Elizabeth Galloway Fashion Academy in Stellenbosch. Attending markets in Durban and handing out business cards, and you can also find Anna-Louise in a number for stockists country wide, Anna-Louise is on different social media platforms, we have a blog, our website & we send out mails updating you on what’s new with Anna-Louise. Our offices are in Kloof in Durban. Seasons, trends, colours, prints, fabrics. I love collecting personalized orders, knowing they are made for someone, and that person will love their new jarmies with their initials or name on the sleepwear. I cant tell you how big my smile is after collecting new stock, a new style, getting fabrics delivered. Loves.. Chocolate, animals, fashion, clothes, magazines, reality TV. Loathes.. negative people, tomatoes, chipped nail polish. I would love to grow Anna-Louise as a brand. Firstly by adding to our women’s collection, growing the men’s sleepwear section and hopefully launch ‘Little Anna-Louise’ a sleepwear collection for kids. Where are your favourite places in Durban? Why do you love Durban? I grew up in Durban, and after matriculating I moved to Stellenbosch and then onto Cape Town, where I lived for seven years. I moved back to Durban a year ago, and even since moving back its become more and more obvious how much I love Durban. I love the people in Durban, how small Durban is – everyone knows everyone. And how Durban has so much talent. With regards to Anna-Louise, I'm over the moon because we are about to launch our eye masks. I've been so excited about these, and have been working from them for the past couple of months. Image Credits: All images taken by Vanilla Photography, excluding the bridal pics at the top of the post.